Is your green bean recipe tired or boring? 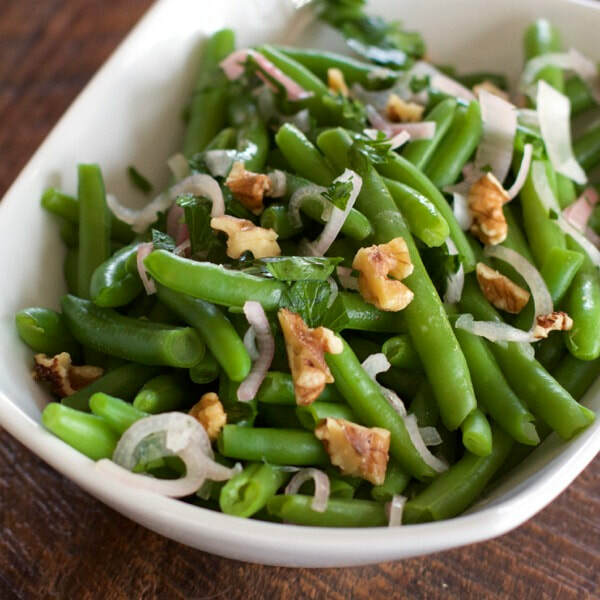 Try these delicious Glazed Green Beans with Shallot Relish. The combination of mustard seeds, vinegar, shallots and parsley creates so many different layers of flavor. We made this recipe for a community event and the whole crowd loved it! Don't have fresh green beans? Try frozen instead. Place shallots and mustard seeds in a heatproof bowl. Combine vinegar, water, sugar and salt in a small saucepan. Bring to a boil, stirring to dissolve the sugar and salt. Pour the pickling liquid over shallots. Set aside at room temperature for at least 30 minutes. Place a large bowl of ice water near the stove. Bring a large pot of water to a boil. Cook beans just until crisp-tender, 1½ to 2 minutes. Drain and transfer to the ice water until cold. Drain, pat dry and transfer to a large bowl. Drain the shallots, reserving the pickling liquid, then return them to the bowl. Stir in walnuts, parsley and 1 tablespoon of the pickling liquid. Bring ½ cup pickling liquid to a boil in saucepan over medium-high heat. Boil until reduced by half, 2 to 4 minutes. Whisk in butter, one cube at a time, until the sauce is thickened. Pour over the beans and toss. Transfer to a serving platter and top with the shallot-walnut relish. Note: To make ahead refrigerate pickling shallots (Step 1) for up to 2 days. Refrigerate green beans (Step 2) for up to 1 day.